There is something sophisticated about cedar plank grilling, yet so simple. 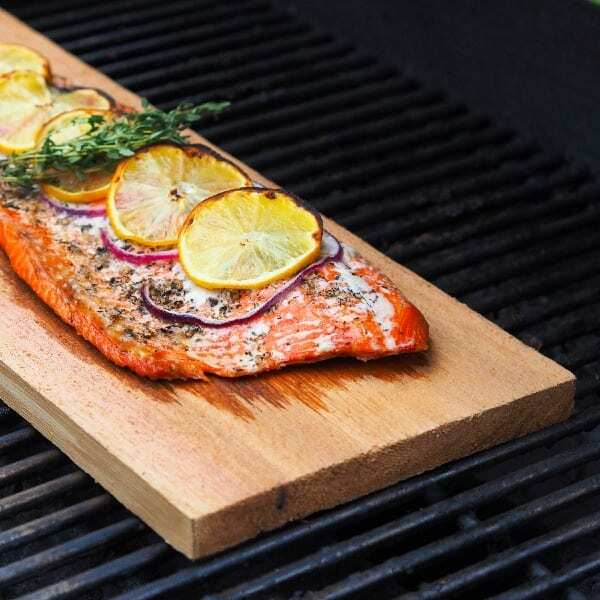 Grilling salmon on a cedar plank infuses a smoky flavor to the fish and prevents the fish from sticking to the grill. The result is a perfect grilled salmon fillet that is flaky and melt-in-your-mouth tender. Fill a large bowl or sink with water. Soak the cedar plank under water for at least 1 hour. In a small bowl combine the olive oil, salt, pepper, rosemary, thyme, and garlic. Mix well. Place the salmon fillet on a large baking sheet and rub the oil mixture all over the fillet with clean hands. Cover and refrigerate for at least 30 minutes or until you are ready to grill (this can be made up to 6 hours ahead of time). Pat the soaked planks dry and place the salmon fillet in the center. Lay the thinly sliced red onions along the center of the fillet and top with the thinly sliced lemon. Season everything again with salt and pepper. Place the plank on the grill grates, close the cover and cook for 10-12 minutes, or until the salmon is done to your liking. Careful not to overcook the salmon. The salmon will continue to cook slightly even when you remove it from the grill. Serve the salmon right on the cedar plank! I love this with wild rice, asparagus, and a big green salad. Enjoy!